With so many vibrant flavors in one dish, it’s easy to make and always a crowd-pleaser. 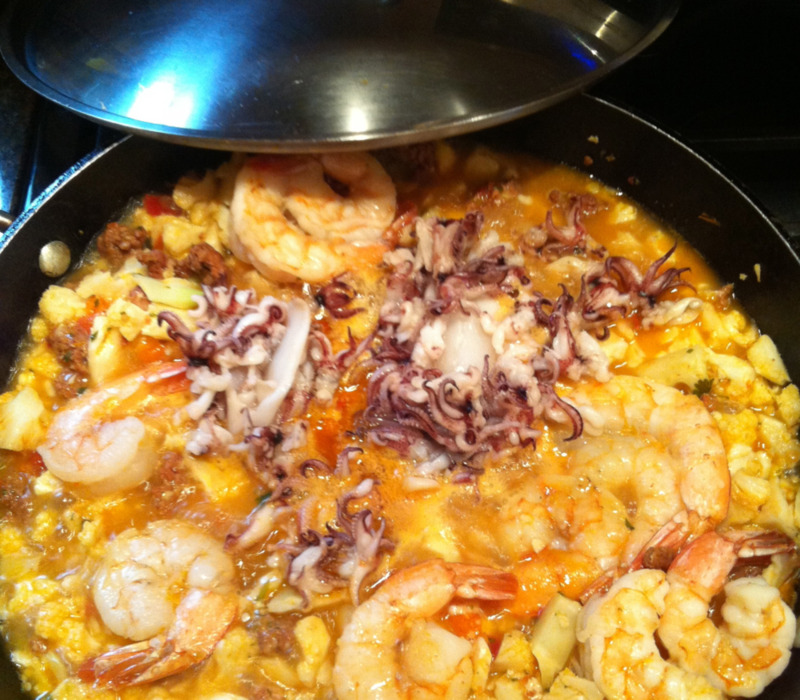 Use a paella pan if you have one or the biggest skillet you own. You can prepare most of the recipe ahead of time and add the last ingredients 10 minutes before serving but the whole process takes less than 30 minutes either way. Gather your ingredients and prepare the cauliflower “rice”: Remove the leaves and core from a head of cauliflower and break up into florets. If you want a fine rice-like texture you can use a food processor and pulse to chop the cauliflower. If you like a chunkier texture use a knife as shown. 2. Cook sausage over medium heat in a large pan (remove from casing if necessary). 3. Add butter, garlic, tomatoes and cook two minutes more. 4. Add the cauliflower to the sausage and cook until just tender. 5. Ten minutes before serving, add the seafood. 6. Cover and cook just until heated through, 5 minutes or less so that it does not get tough. 7. Toss in scallions, cilantro and lime juice and serve!